Melting of land-bound ice (glaciers everywhere and ice on Greenland and Antarctica land). 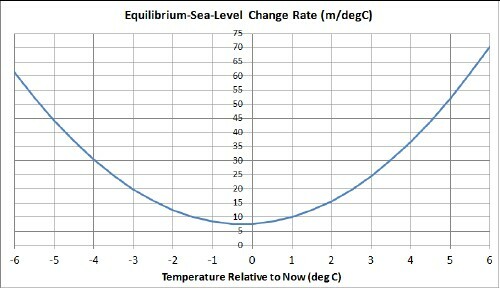 By studying past times when the equilibrium temperature was different than now, and thus the equilibrium sea level was different than now, one can estimate how much equilibrium sea level will rise as equilibrium temperature rises. There is a time lag (response time) of up to a thousand years after a temperature change before the equilibrium sea level is reached. 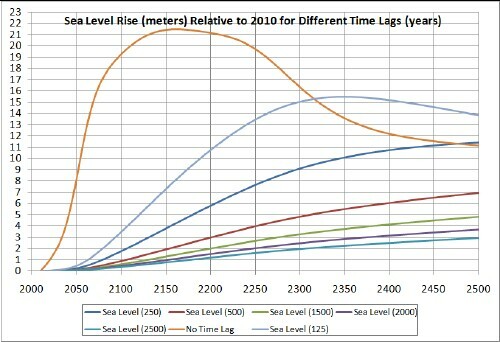 The time lag may vary depending on the environmental situation. There is an excellent book relevant to this report The Rising Sea by Orrin H. Pilkey & Rob Young. If the Greenland ice sheet were to all melt, sea level would rise by about 7 meters or 23 feet. If the Antarctica ice sheet were to all melt, sea level would rise by about 60 meters or 200 feet. 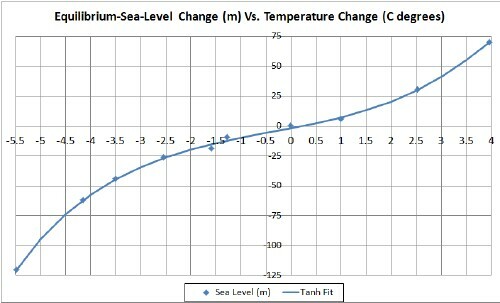 I use the data given in The 5 Most Important Data Sets of Climate Science and a graph for New Guinea in Florida and Bermuda Records of Sea Level to derive an equation for the change in equilibrium sea level (L in meters) as a function of the change in temperature from now (T in Celsius degrees). 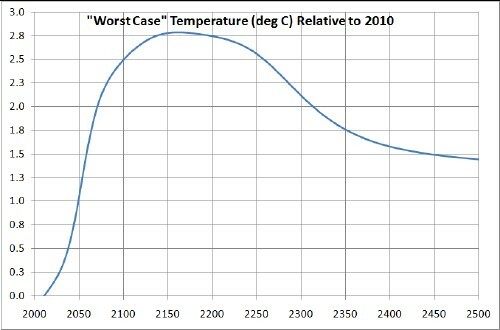 The temperatures (relative to 1990) to go with the sea-level data from the second reference were taken from the Vostok Antarctica ice core data with a variable factor to allow for the fact that Antarctica temperature changes are larger than average earth temperature changes; the factor searched to 0.64. The point at about -5.5C° is for the Last Glacial Maximum about 20,000 years before present (ybp). The point at about -4.2C° is for the minimum about 112,000 ybp. The point at about -3.5C° is for the minimum about 89,000 ybp. The point at about -2.5C° is for the minimum about 60,000 ybp. The point at about -1.6C° is for the maximum about 81,000 ybp. The point at about +1C° is for the Eemian geological period (the previous Major Interglacial) about 125,000 years ybp. The point slightly above +2.5C° is for the Pliocene geological period about 3x106 ybp. The point slightly below +4C° is for the Eocene geological period about 40x106 ybp. The points chosen during the last Major Ice Age (125,000 ybp to 20,000 ybp) are for maxima and minima. In the interest of truthfulness, not all the other data points in the 2nd reference fit the curve so well. At very low temperatures much or all of the Earth is covered with ice. Most of the ice is on land or prevented from displacing sea water by rigid attachment to land. Melting such ice adds to the ocean water, which adds to thermal expansion of the water to greatly increase sea level. 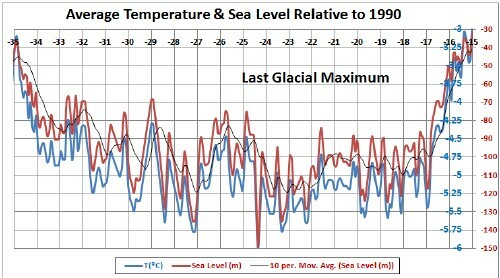 At very high temperatures most of the sea ice has already melted. So melting the remaining ice on the land adds to the ocean water, which adds to thermal expansion of the water to greatly increase sea level. At intermediate temperatures, as is the case now, more melting is for sea ice than in the other two cases. Since sea ice is already floating in water, its melting adds very little to sea-level rise due to land-ice melting and thermal expansion of the water. 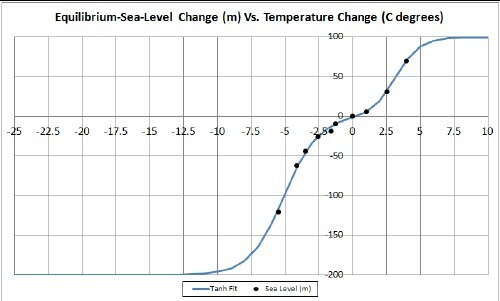 Various references (1, 2, 3, 4) give the equilibrium sea-level rise for thermal expansion of 0.7 meters per Celsius degree change in temperature. That rise is negligible relative to the equilibrium curve given in the figure above (7.6 m/deg now and 70 m/deg at 6 C° relative to now at the right edge of the curve). 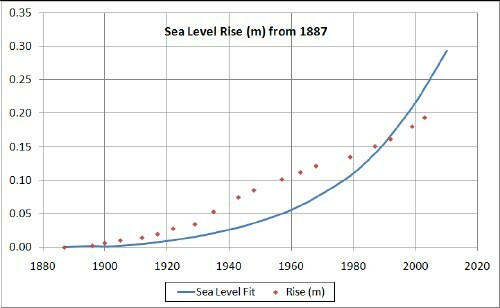 So most of the equilibrium rise in sea level is due to melting ice. for positive temperature change from now. for negative temperature change from now. More data at larger temperature changes are needed to have confidence in the values of the asymptotes. The t1 is the year 2010 and n is the number of years from 2010. 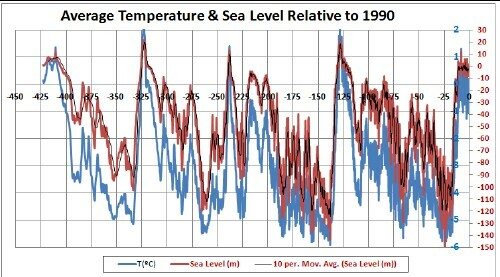 Peak fossil fuels causes the temperature peak. 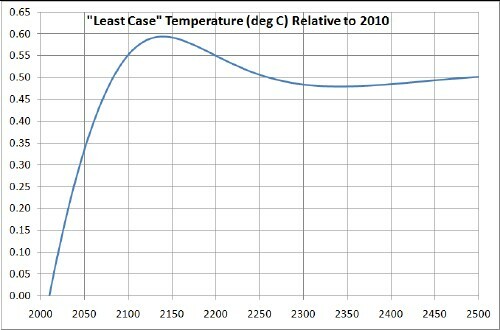 Here the temperature peak is due to both peak fossil fuels and to an assumed later peaking function for releasing carbon from the Earth. 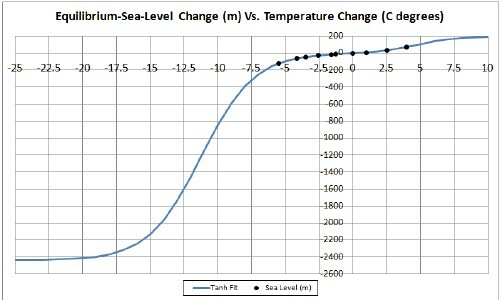 The curve is calculated from the fit of sea level vs temperature given below for a 523-years hyperbolic time constant. The hyperbolic time constant searched to 523 years, even when the search was started from near zero years and 10,000 years, which corresponds to an exponential time constant of 262 years. 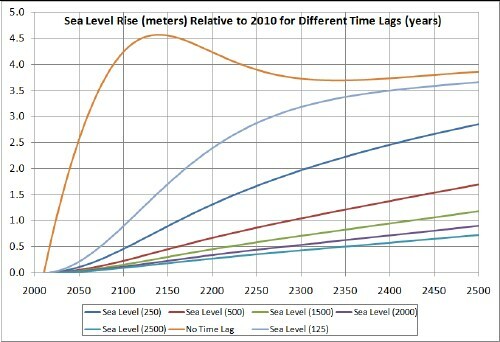 So, it appears that the sea-level rise by 2100 will be between 0.44 and 1.7 meters. This work was greatly benefited by several papers by Prof. Stefan Rahmstorf. 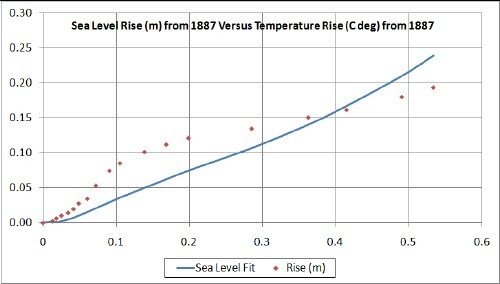 The sea-level rise is about 0.1 meters per Celsius degree change in temperature for the top well-mixed 500 meters at the surface of the oceans. This mixing probably has a time constant for absorbing heat from the atmosphere of about a decade. The lower average depth of 3300 meters probably has a time constant for absorbing heat from the top layer of about 1000 years; heating it by one Celsius degree would raise the sea level by about 0.6 meters. 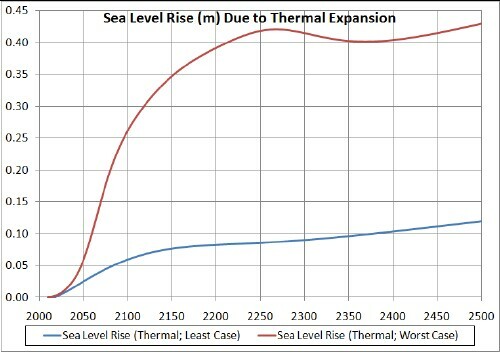 Comparing these curves with the last graph shows that the sea-level rise due to thermal expansion is small compared to total sea-level rise.The thermal sea-level rise is between 0.06 and 0.26 meters by 2100; compare that to the total sea-level rise by 2100 of between 0.44 and 1.7 meters. The difference is a factor of about 7. 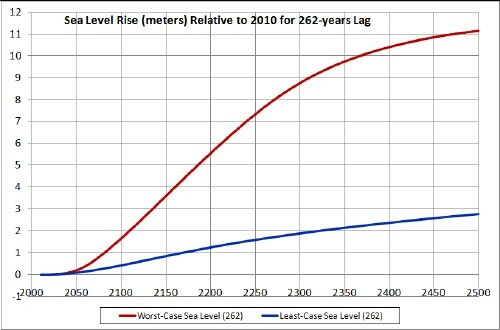 If there were no time lags for both ocean layers, the sea-level rise due to thermal expansion would be between 0.4 and 1.7 meters by 2100, which would be equal to the total. This shows the last Major Ice Age including the two Major Interglacials at each end. This shows the last Major Interglacial (Eemian) and its entry and exit. The sea-level calculation is for equilibrium. 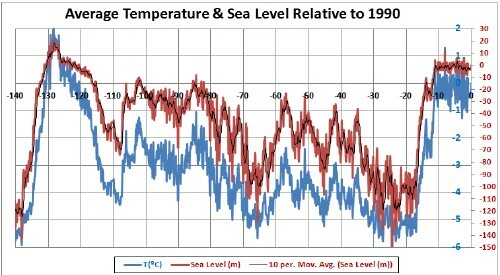 The instantaneous sea level might be somewhat lower depending on the time constant for reaching equilibrium with changing temperature. 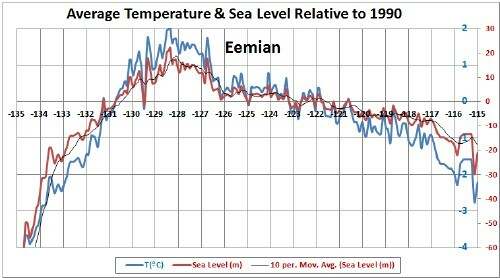 In fact, the excellent https://en.wikipedia.org/wiki/Eemian web page gives a lower sea level at Eemian peak: 4-6 meters. This shows the Last Glacial Maximum and its entry and exit. 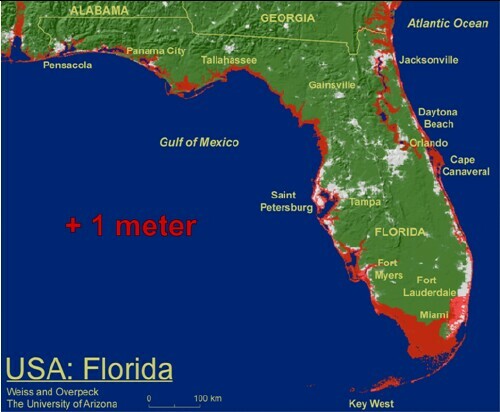 This rough calculation yields sea levels between +22 meters and -149 meters compared to the 1990 level. The average = -45 meters and the standard deviation = 36 meters.